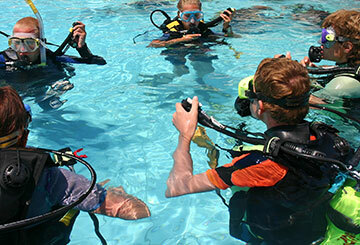 We offer scuba diving training and equipment from the leading scuba manufacturers and scuba training agencies. We’re the Premier Scuba Diving Shop and School, scuba equipment retailer and scuba service centre for Hertfordshire, Essex, Cambridge and surrounding areas. Your equipment is supplied through official distributors covered by an official guarantee for a minimum of 12 months! We stock all types of scuba equipment including BCD’s, wings, regulators, masks, fins, snorkels, diving computers, wetsuits and drysuits. We also offer full technical equipment including Poseidon rebreathers! The Planet Scuba staff are experienced divers and instructors, having over 40 years’ experience scuba diving and teaching to all levels. 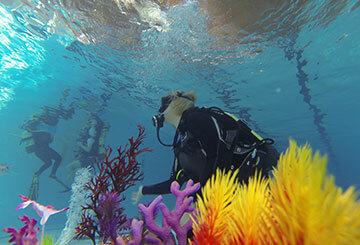 We have both male and female instructors, assistance instructors and divemasters from all walks of life. If you’re stuck for an idea for a special occasion or birthday party, why not try something different, adventurous and fun at Planet Scuba? 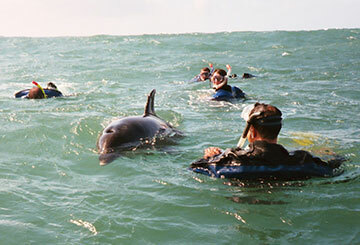 Planet Scuba are happy to organise regular scuba diving holidays to fantastic locations throughout the UK and overseas. Whether you are an experienced scuba diver or a total novice, the Planet Scuba team are a recognised and respected scuba diving school for all. Dive Computers batteries starting from £40. Next day battery change, express 1hr service or post back options. Keeping your Equipment in top condition is important, All major brands of regulators and BCDs, Serviced.